from Mommie Dearest. 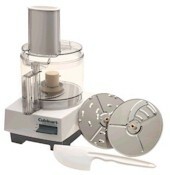 It's a 7.5 cup Cuisinart Food Processor. Oh boy! Pastry, pasta, pesto, oh boy! Can't wait to try it! When I picked it up this morning at the post office the lady who brought it to me said, "Now if for any reason, you decide that you don't want this or can't use it....Remember that I'm here and I'm very envious." LOL She was so funny. I promised her if the pastry attachment worked and if the pie turned out good, I'd bring her some. Who knows, I just might. I promised Mom I'd take pictures of anything I make with it. This should be interesting. Well feel free to send me anything you make because I don't like to cook AT ALL. But I do out of guilt because they girls have to eat...lol. You should definitely take the woman at the Post Office a pie. You might get a free stamp or something.